The list of Laurie Bagley’s accomplishments is staggering. She has summited the world’s tallest mountains. was inducted into the California Outdoors Hall of Fame, has completed numerous marathons and is a top-finisher in adventure races. She cycles, backpacks, skate skies and snowshoes. It’s an enormous understatement to say that Bagley is active. She builds exercise into every day and doesn’t sit still for long. Yet the lean and fit 50-year-old athlete has experienced a shift in her life, a shift that has led her away from the competitiveness that drove her for so many years. She’s done competing, she says, but she’ll never be done enjoying the outdoors and activities she loves. No longer trapped by the need to compete, Bagley found herself free to explore new options. The prospect of helping other achieve their goals was appealing, so she began evaluating her own goal-setting ideas and personality. Then she launched a business , Life Journeys (now known as health-fitness-coaching.com). Bagley has lots of experience in accomplishing huge goals, but her approach to reaching them is rather simple. “Accomplishing a big goal is all about breaking it down into smaller, one-step-at-a-time pieces. this will take you to your highest potential,” she says. Joy Taylor, coordinator of the Sustainable Communities program at College of the of Siskiyous and a private small business development consultant, hired Bagley as a personal fitness coach. She trained me and helped me prepare for summiting Mt. Shasta,” said Taylor, a personal friend and COS colleague of Bagley’s. But Taylor stresses that Bagely helps people accomplish goals at levels. “She has the ability to customize programs to each client. She’s an extremely intuitive person who can work with people where they are. She’s very realistic in developing a plan they can achieve one step at a time. ” Taylor said. She guides for Adventures International and Call of the Wild, as well as whitewater river trips. In addition she teaches Outdoor Adventure Leadership Skills through CO’s Environmental Resources department. She recently returned from a three-week trip to Nepal, where she helped guide trekkers to the Mt. Everst base camp at 18,700 feet, a 10-to-12 day feat that she says is physically, but not technically, demanding. “We go at a slow pace so they can acclimate to the elevation,” she said. Part of the group continued up, attempting to reach the summit with two high-altitude guides and Bagley led the trekking – only group back down. Before departing for her recent trip, Bagley said she would seek philanthropic projects in Nepal. “The opportunities are present everywhere. It’s endless, the need ,” she said. “This time I’m going over there with those eyes.” Bagley like so combine charity with her projects. During her Everest effort, she donated some of the money she raised to KIRF India, a charitable trust based in Mount Shasta that provides health and education assistance for poor communities in India. “I wanted to go over there with a bigger purpose,” she said. For 16 years, Bagley has lived in Siskiyou County, a place that feeds her soul. “I see Mount Shasta as a very connected, wonderful outdoor mecca. It’s a great place to be,” she said. Her north state roots run deep. When Bagley was 10 years old, her family moved to Redding from Colorado. She attended Sequuoia Middle School and Shasta High School District. Bagley has two siblings – a brother, a former Blackhawk helicopter pilot who now lives in Alabama, and a sister, an administrator at Anderson High School. Jean Bagley said her daughter’s high energy level presented early in life, and she was involved in sports, music, cheer leading, gymnastics and lots more. “She’s very self-motivated. I’ve seen her achieve a lot of things,” Jean Bagley said. “She’s an incredible athlete; she just has this gift.” But she also offers a bit of advice. “I tell people not to go on a bike ride with her unless they’re an experienced rider.” which can turn out to be a 20-mile ordeal, her mother said. After high school, Bagley earned a degree in psychology and recreation therapy at Chico State University. Since then, She’s added three teaching credentials to her resume and a master’s degree in outdoor leadership from Southern Oregon University. She’s taught school in Colorado, Oregon and California. Amid all the climbing, trekking, biking, speaking, teaching and the like, Bagley found time to write a book, aptly named. “Summit! 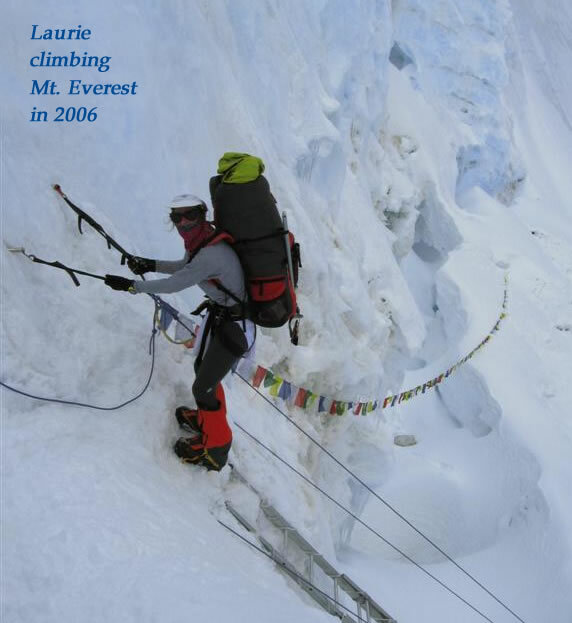 One Woman’s Mount Everest Climb Guides you to Success”, which was released late last year. “Summit! coordinates with Bagley’s workshops and presentations, Bagley will tell you that finishing that book was one of the most difficult and challenging things she’s ever done. Originally relying on the expertise of ghostwriters, Bagley ended up finishing the last half of the book on her own. She considered abandoning the project because she never saw herself as a writer and lacked experience. But she found a publisher that gave her assistance and support from a writing coach. “I’m so glad I stuck with it. I’m so grateful that I had the chance to overcome my fears. I’m not afraid of mountains, but I was afraid of finishing that book,” she said.